How To Change Video Format With Best Free Video Format Converter? How to change video format like convert MKV to MP4/AVI, video to MP4, now taclked with best free video format converter for Windows and Mac. You can also count on it to change video format to iPhone iPad. Use NO.1 fastest video format changer to convert video to MP4 is much faster than you download video codec packs like MKV or. Now free download the software to change video format superfast. NO.1 fast option to change video format to MP3 AAC on Mac/Windows with Intel QSV/Nvidia NVENC support! The free video format changer convert a 4 minute video to MP3 in 5 seconds. No need to download video codecs, it converts any video format you throw at it! Change Video Format - Convert A 4-minute Video to MP3 AAC In 5 Seconds! Welcome to the upgraded 18x faster software to change video format! Built-in with Intel QSV/Nvidia NVENC support, 5KPlayer brings top-notch experience to convert any video format like MKV MP4 AVI video to MP3, AAC. The only free video file converter with an hardware-acceleration option in 2015! Embracing the upgrade with Intel QSV/Nvidia NVENC on par with 5KPlayer, another outstanding Video Converter for Windows 10/8/7 and Mac [El Capitan indluded] renders even better support to convert MKV to MP4 or convert MKV to AVI, and all popular output format. Just feel free to convert videos to iPhone iPad, Windows Phone, Sony or Android. One thing to note is that, this free video format converter is dual-functional in design. Being a universal media player for all format, it natively plays MKV, AVI, MTS, MOV, and plays VOB videos, video_ts without any external help. In front of such problems as VLC H.265 H.264 playback problems, or movies won't play without codec for Windows Media Player, isn't it much easier to opt for a free player-and-converter, and change video format superfast? Besides change the format of videos that your player can't recognize, you may download Coded packs to tackle such problems as Quicktime won't play mov, or MKV won't play without MKV codec for Windows Media Player. This, to tell the truth, is much more time-consuming. In this regard, a multi-purpose software to change video format and play all video format is much more usable. 1:1 convert means no digital signal would lose when you change video format. 5KPlayer as an ace in the hole of HD video playback, has configured its encoding and decoding technology such as H.265 streaming to convert videos up to 4K or 8K without quality loss. Take HEVC H.265 [High efficieny video coding] as an example, you may experience quality loss when you change an H.265 video format - directly reflected in the shrink in converted file size. 5KPlayer, however, extracts complete audio file from a H.265 video if you use it to download YouTube to MP3, saving audio output in its original quality. convert the videos movies into .mp3. Download the best free video format converter for Mac or PC, 5KPlayer setup takes only 50 seconds to finish. It can recognize your local media library, or you may download YouTube movies directly. Step 1: On the interface click "Video" to access the video in your media library. * If you set 5KPlayer as your default video player, all videos and music in your library will automatically get listed in the Playlist. Step 2: When recognized by 5KPlayer, close the playback area, then re-hit the Playlist button, find the specific video file, click convert. * 5KPlayer natively support convert video to MP3/AAC, you may get external help to convert MKV to MP4 AVI when you hit Convert to MP4. How to Change Video Format for AirPlay? Step 1: If you would like AirPlay video from PC to Apple TV, or from Mac to Apple TV. 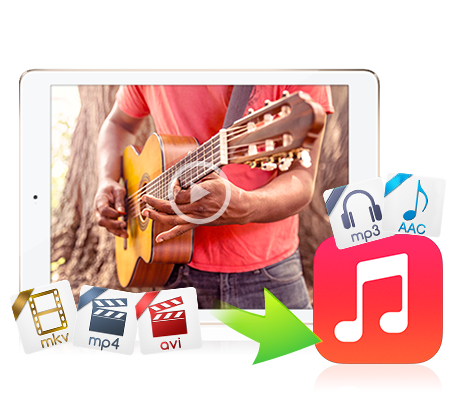 Change video format into AirPlay supported ones: MP4 MOV M4V video and MP3 AAC music. Note: A yellow icon will appear to recommend you to change video format if it is not AirPlay supported. Step 2:Click the AirPlay icon on top-right corner of 5KPlayer, choose the Apple TV name from the list, and 5KPlayer can stream videos from PC/Mac to Apple TV. Note: Connect the PC and Apple TV to the same WiFi before you start AirPlay. The best free video format converter walk you through high-quality and superfast process to change video format. This dual-functional software supplies all-round support to video codecs including MKV, AVI, MP4, MOV and more. You may also expect other feature-rich video editing functions from this video to MP3 converter, such as adding subtitles, deinterlace videos, and you name it.